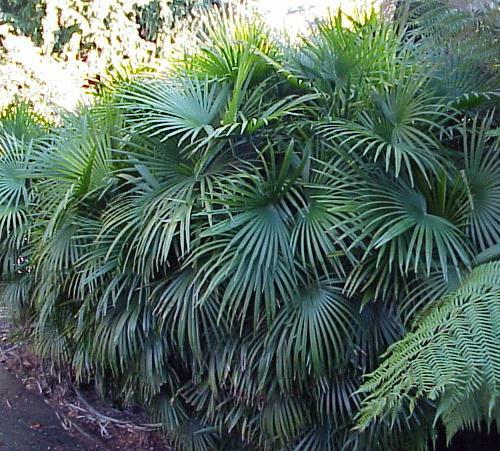 Rhapis multifida is a relative newcomer to the palm collectors. Native to southern China and has a cold hardiness of 28� F and will even tolerate light frost without damage. The suckering trunk is thin with a brown woven fiber on it. The leaves dark green and are an almost full circle palmate with long thin leaflets. The leaf fan has an unusual characteristic in that the center and two outer leaflets are wider than the others. Leaves can also reach up to 24 inches across, but this is usually only in low light conditions. Typically there are about a dozen leaflets to each fan, but some actually have as much as tripled this amount. This can grow to about 6 to 8 feet tall and is a moderate grower given the minimum requirement of rich well drained soil in a moist and shady or filtered sun location. Inflorescence is among the leaves and enclosed in tubular bracts, that are multiple branched. Fruits are rounded to oval, and are about 5/16 inch long. This is suitable for as a patio palm since it does not get too large. 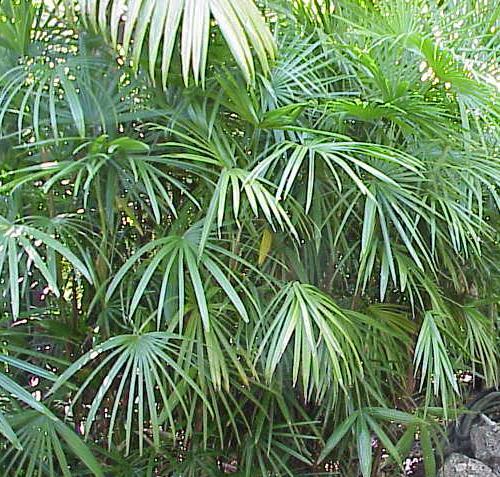 Some consider this the ultimate Lady palm due to the fan leaves with its numerous narrow segments and slender canes. Availability of this tree is limited, but worth the effort to get one or more for your surroundings and you will be rewarded with one of the most desired Rhapis varieties. This is the most delicate looking of all Rhapis and also makes an extraordinary house plant.